Now that we’ve all had some time to get home from last week’s CPRS National Summit 2014 in beautiful Banff and settle back into “reality,” I wanted to offer my reflections on the conference and what it means to be the new President of the best little chapter that everyone knows (and loves), Northern Lights. The gorgeous setting for our conference, the Fairmont Banff Springs. This was my third national conference and they keep getting better. The sessions and opportunities to learn are always good of course, but the conference is so much more than that. It occurs to me now that the greatest value in these conferences is the networking, as cliche as that may sound (and I don’t just mean the socializing, of which there was a little, I’ll admit). Our now past national president, Richard Truscott, put it nicely when he referred to the conference as his chance to see his “once a year friends.” I’ll go a step further to call some of these people my “once a year best friends” or even “once a year family” (but maybe that’s the millennial in me; we’ll let Jeremy Berry decide that). I was really struck this year by how open, sincere and willing to converse everybody was. Perhaps this was partly due to the fact that I was actively trying to get out of my shell a bit more than comfortably normal for this introvert and meet people on behalf of my chapter, but I had so many amazing conversations. Your VP (Jonathon Dyck) and I (along with our Secretary/Treasurer Renee McCloskey as National VP) attended the President’s Council to get things going. It was really great to be involved in these conversations and hear what sort of challenges other chapters are experiencing across the country. Turns out, a lot of them are the same. I also realized (and all due respect to our fellow chapters) that a lot of the challenges others face, aren’t even issues to us. I believe that’s a testament to how passionate and dedicated we are, in a variety of ways. Regardless, it was great to open up some lines of communication with other chapters, particularly the other two BC chapters, who we intend to collaborate with a great deal more over the coming year as we work on our live streaming and regional engagement strategies. Back to the conference, we made quite a name for ourselves. After the opening ceremonies, where we celebrated our member and communications co-chair Shelly Burich receiving her APR with giant signs (congrats again Shell! ), everyone knew who Northern Lights was. Even Scott Stratten was quite taken by us and recognized us as he delivered his keynote. Following that, everyone I met just seemed to know who we were, and that was such a great feeling! Of course the biggest highlight of the conference was the awards gala, where our chapter was awarded with the Lectern Award and the CN – Emery Leblanc Award (under 75). I was honoured to go across the stage and receive these for my chapter. Of course the rest of us in attendance had our signs out then too! ;) Some people know our chapter as the “rowdy” ones (and a variety of other adjectives, I’m sure), so I feel like winning awards like this makes a great statement that although we might play hard, we work hard too. 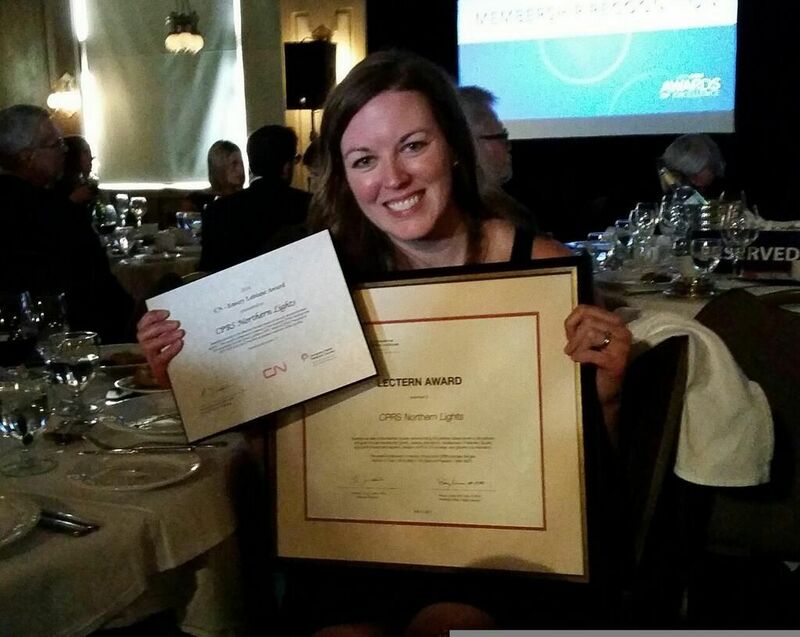 Jessica Quinn with the CPRS Lectern Award and CN – Emery Leblanc Award (under 75). Photo credit: honourary CPRS Northern Lighter Everett Martin. I’ve been involved in CPRS for about 5 years now and I couldn’t be more proud of us! I’ve seen some great advancement, and I’m so excited for this next year as President to be able to move us even further ahead. I know that part of our charm is our small size, but I’m confident that we can continue to grow and extend into other regions, all the while maintaining our close-knit, respectful, passionate culture that everyone knows us for. Fantastic piece Jess. This year was truly something special. My pride for being part of the best little chapter certainly swelled. We were repeatedly recognized formally and informally for our strength. More important than that to me is the fact many of our newer, younger members share the passion for what makes our group so special and have stepped up to the plate to protect and grow our unique character and niche. It’s hard to believe 15 years ago we were a fledgling new chapter with less than half a dozen members. We’ve come a long way baby! Thanks for all of your support Renee! We definitely couldn’t do anything without you! Great post, Jessica. 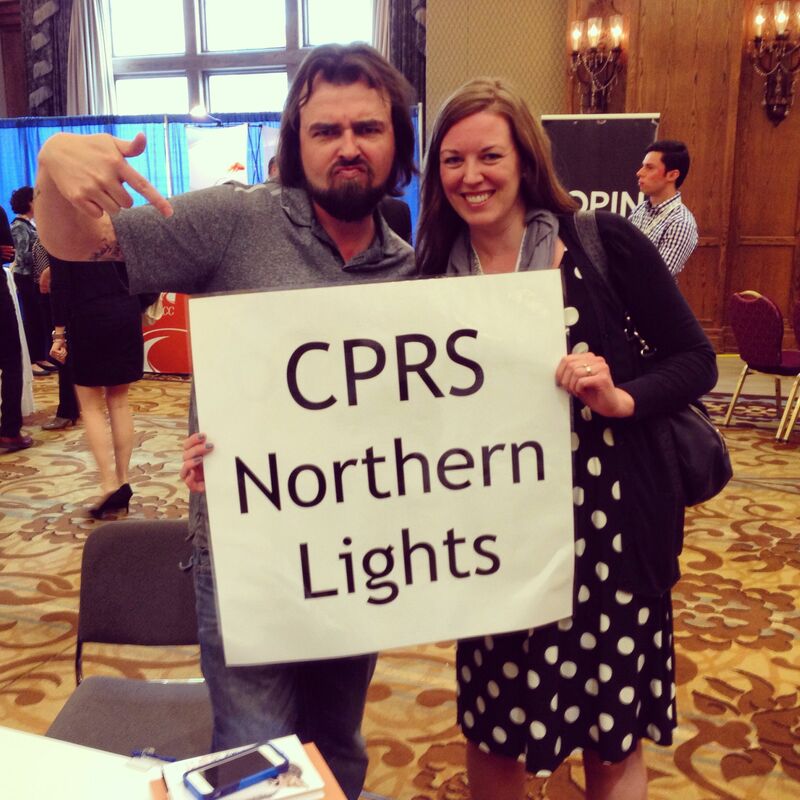 Northern Lights is definitely a big part of the heart and soul of CPRS. Keep up the great work! Can’t wait until your chapter hosts a CPRS National Conference in Kelowna in a few years!!! This conference was a bit more exciting for me for a couple reasons. This was the first involvement of the national PD committee in selecting/directing a number of keynotes and presenters. We also really aimed to start the conference strong with Scott Stratten as a keynote. He set the stage for three solid days of learning and networking, coupled by keynotes such as gamification guru Gabe Zichermann and the Canadian Space Agency’s Anna Kapiniari. Not to forget the crisis communication panel, ethics panel, and a load of great workshops. Lastly, I was honoured to join Shelly in receiving my Accreditation. What a great class of APRs to join the club this year!!! I’ve often used the CPRS conference as a grounding spot where I rethink and relaunch my personal and professional life each year. The past couple years I haven’t found this to be that moment (for a variety of reasons). I returned from Banff feeling like I got a fresh start. I’m pumped by all that I learned, excited by what will happen locally to nationally with the CPRS, and smiling from my time with my family. It is about family. The cool thing about this family is that you actually like all of them, and like any family, you learn from each other and come about a better person. I didn’t know you were involved in national PD Tim – it was truly excellent this year! Well done! Great seeing you, and we’re definitely holding you to coming to PG for a visit over the next year! 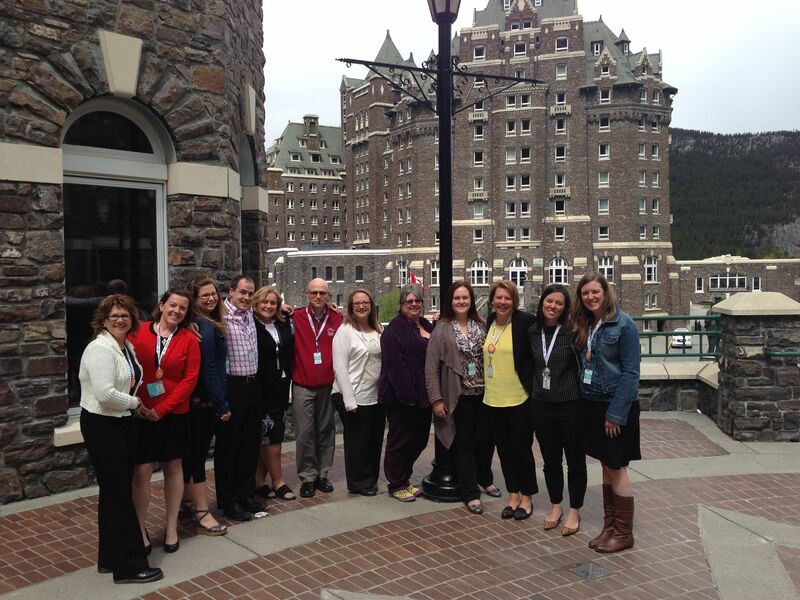 I recently attended the Canadian Public Relations Society National Summit in Banff, AB. Being a new president for my local chapter, I took a lot away from it… here are my reflections, originally posted on the CPRSnorthernlights.com blog.